Email marketing is something that many business owners consider necessary, but few do really well! What is your email marketing strategy? Do you have one? A 2015 report by the Radacati Group estimated that the average consumer in 2018 may receive and send over 100 emails a day. As a business owner trying to reach your customers, how do you get your messages to stand out in their inboxes? Below, we touch on some of the industry best practices for sending emails that your readers will want to open. A good email subject line needs to be clear and to-the-point. This tip may seem basic, but many people don’t put enough effort and thought into crafting and testing email subject lines that engage clients. Mike Huling, co-owner at Reformation Fitness in Washington D.C., recommends that you think about the subject in terms of communicating an enticing prospect at “first glance.” In other words, if someone skims their inbox and reads the subject of your email without knowing what is written inside, will they know to expect? As you are preparing the email, ask yourself what is the main point you want to communicate. Once you know that, work on distilling that message and a relevant call-to-action related to it in somewhere between 10 – 90 characters (with spaces). You should always have a purpose for sending a client an email, whether that’s to announce a new promotion, communicate changes to your class schedule, etc. An email is about quickly conveying a message and getting the reader to move out of the email and do something based on what they’ve read. 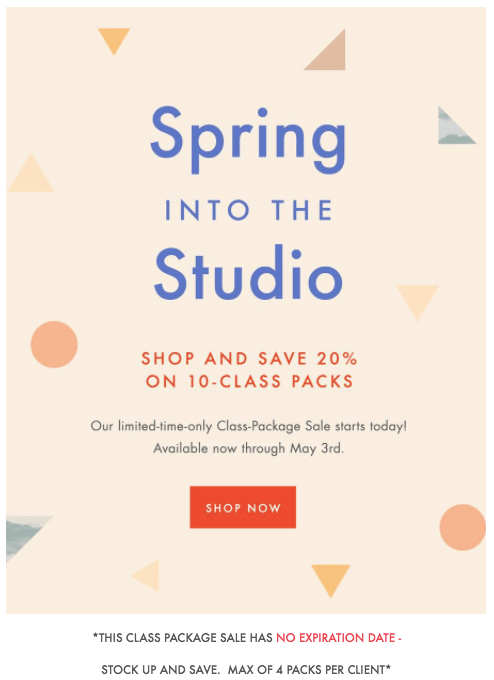 So you want your client to not just read the email, but to take action based on what you’re sending — whether that’s to book a class or purchase something. That’s why it’s crucial to create little-to-no-barriers on taking action. If you want a reader to register for an upcoming workshop, dedicate the email solely to that and don’t bury it under various other announcements that aren’t as timely. You should also have a very clear, concise call-to-action that sends them directly to the registration or purchase page. Incorporate buttons that will stand out with a clear message about what that button will help the reader do. When you make it easy for someone to follow through on an action, you will likely have more success than if you just send them to your website or write a paragraph without giving them a link or clear next step to take. Try to offer something to your readers in your emails—whether or not it’s a promotion or a giveaway—to make it feel like they are gaining something by opening your email. The offer could be to download a new schedule, to check out a new class, or to meet a new instructor. Whatever it is, present the content in such a way that it makes the reader feel like they are receiving something of value. Huling shares, “Not every promotion needs to be a discount or sale. Sometimes offering a fun reward or bragging rights can achieve far more in terms of building longer term community for your members.” It also helps to highlight this content early in the email, especially if that is what your subject mentions. 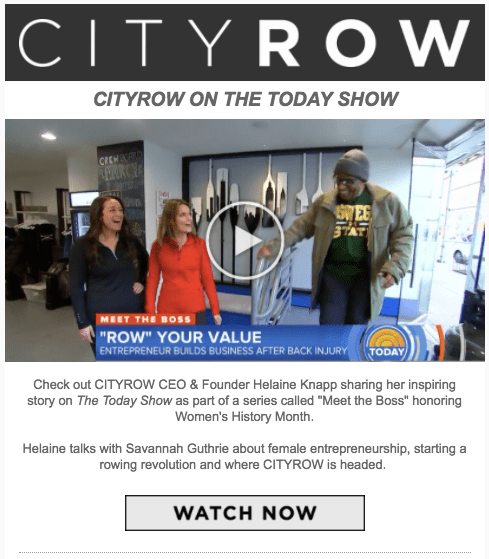 Don’t force readers to scroll or read the entire email (if you include other content) to get to the main subject! Exciting news such as this can be valuable to share with your community. Here, the studio included a clear call to action “Watch Now” along with an image of the video clip to entice readers to click through. Whenever you offer something—a discount, a competition, a free demo or class—give a timeframe right in the subject. A person will be more inclined to take a look at something if they know they could miss their chance by waiting. Conveying a sense of urgency can push people to open your email to at least see what’s going on, and getting them to open the email is half the battle for successful email marketing! A person will be more inclined to take a look at something if they know they could miss their chance by waiting. Maybe your promotion runs for a week only or for a weekend, or maybe an offer is limited to the first 20 people who sign up. Huling suggests being reasonable with timeframes so that depending on the action—registering for an event, taking advantage of a sale or sharing feedback—you give them enough time to do whatever they need to be able to follow through, which may mean checking work schedules or consulting their budget to make sure they can swing a purchase. If someone emails you about a service or product that directly speaks to your interests, you are much more likely to act upon it than if a company constantly sends you generalized emails that only occasionally touch on things that interest you. That’s why sending emails tailored to the correct audience may be the most important strategy for promoting engagement through email marketing. What are some ways you could segment your email lists? Try narrowing down to brand new members who’ve just recently visited your studio for the first time, versus your loyalists who have been coming to you for over a year. Both of those customer segments have very different needs from your business, so you need to communicate to them differently. 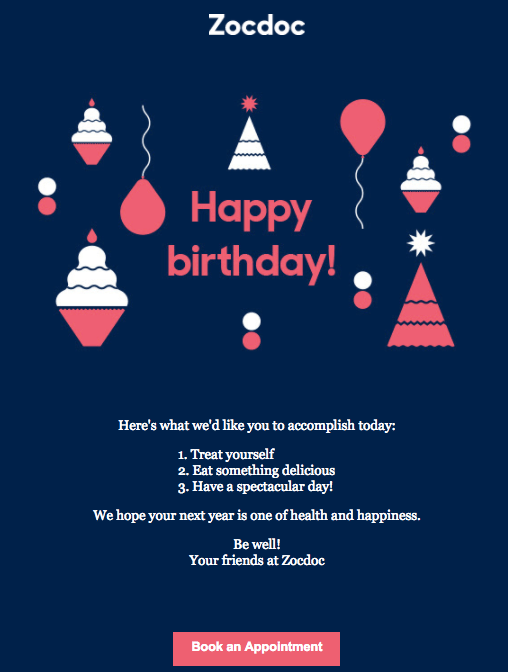 Further, you could dive into creating unique lists based on workshops clients have attended at your studio and targeting them once you’ve got another one lined up, or emails based on prior usage or class attendance, special birthday emails, etc. The more personal you can make it, the better. Bonus tip: Add their name in the subject line to drive even higher open rates! In order to continue to effectively communicate to customers and get them to open you emails, you need to be testing and tracking your email metrics. If you don’t know what’s working or what isn’t, you won’t be able to refine and improve your strategy. Do split testing with different subject lines in emails within the same targeted list and see what gets more opens and clicks. Test what day and times people open your emails in the highest volumes. While many studies say that emails get the most opens on Tuesdays, maybe your members prefer emails from you on Sunday evenings as they prepare for the week—customize it based on the results you are seeing. Test different segments with different calls-to-action and track the click-through rate. The more you can actually track your readers’ behavior, the better you will be able to customize it to their needs in order to stand out in their inbox!